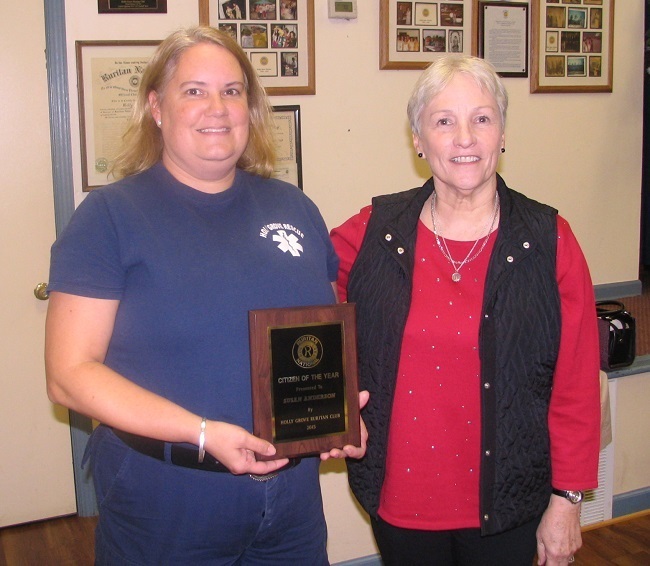 Holly Grove Ruritan honored Susan Anderson with the Citizen of the Year award at their December 8, 2015 meeting at their club house in Bumpass, VA. The Holly Grove Ruritan President, Dianne Montgomery presented Susan with a commemerative plaque. Susan has lived in Holly Grove most of her life and has always given back to her community. She teaches kindergarten at Jouett Elementary School and has been a teacher there for 15 years. Susan packs backpacks with food at Hopeful Baptist Church each week to take to Jouett for children who may not have enough to eat over the weekend. She teaches Sunday School at Hopeful Baptist Church and helps with Bible School and other committees at the church. Susan is also a volunteer with the Louisa County High School Future Farmers of America and helps out with the Louisa Agriculture Fair every year. This year Susan was voted “Best EMS Provider” in the Louisa County “Best of 2015” campaign. She also received regional honors as the “Best EMS Provider.” Susan is a family and community minded person whom the Holly Grove Ruritan Club was proud to honor with this annual award. Also during the December meeting, Ruritan National Director Sarah Kelly installed the incoming club officers for 2016: Alex MacDonald, President, Dianne Montgomery, Vice President, Sue Sheridan, Secretary, Kenneth Gammon, Treasurer, and Lesa Welton, Director. The new officers will serve in their positions from January 1, 2016 through December 31, 2016, with the exception of the Director, who serves a three year term. 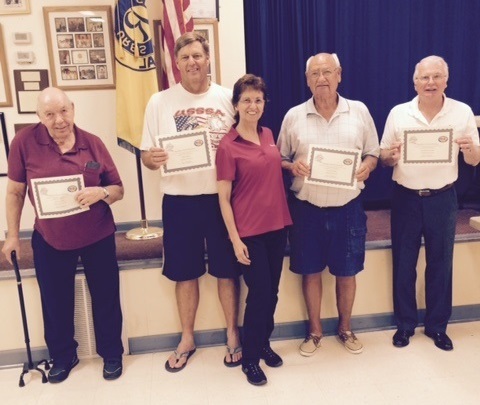 The Rapidan District Ruritan Cabinet honored the military veterans of the Holly Grove Ruritan Club July 9, 2015 at the Holly Grove Ruritan’s Clubhouse in Bumpass, VA, by presenting them with Certificates of Appreciation during a visit by the Rapidan District Governor, Linda Bradshaw. The presentation of the certificates is part of the Rapidan District’s plans to thank, appreciate, and honor all of their local club’s veterans. 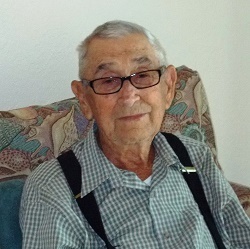 James McCoy Noel, 94, of Holly Grove, born July 2, 1920, died Thursday, February 12, 2015. He is survived by his wife of 73 years, Alice Harris Noel; his daughter, Mary Alice Noel; a brother, Lloyd Noel; and a sister, Ruth N. Bourne. He is also survived by his extended family and friends including Gwen and Norman Rose, Stephen and Janette Rose, Andy and Twila Rose, his namesake great-grandson, Galen James Rose and great-grandchildren Zachary, Savannah, Monty, and Mariah Rose. James was preceded in death by his brother, Henry Noel; and sister, Beatrice Noel Lloyd. James was a lifelong member of the Holly Grove community who was active in many community organizations. He was a charter member of both the Holly Grove Volunteer Fire Company and the Holly Grove Ruritan Club. 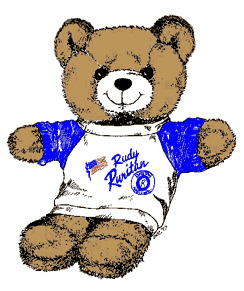 He was a Ruritan Forever Member. He was an Elder Emeritus at Holly Grove Christian Church. If there was a community activity, James and Alice were there and probably working. The family received friends from 6 until 8 p.m. on Friday, February 13 at Holly Grove Christian Church. A funeral service was held at 2 p.m. on Saturday, February 14 at Holly Grove Christian Church. Interment was in the church cemetery. Memorial donations may be made to Holly Grove Christian Church, 1637 Holly Grove Drive, Bumpass, VA 23024. Arrangements were made by Lacy Funeral Home, Mineral, VA. The Holly Grove Ruritan Club held its 2015 Officer Installation ceremony December 11, 2014 at the club headquarters in Bumpass VA during their regular December club meeting. Rapidan District Governor Al MacDonald did the honors of installing President Dianne Montgomery, Vice President Rhonda Gorman, Secretary Sue Sheridan, and Treasurer Kenneth Gammon. 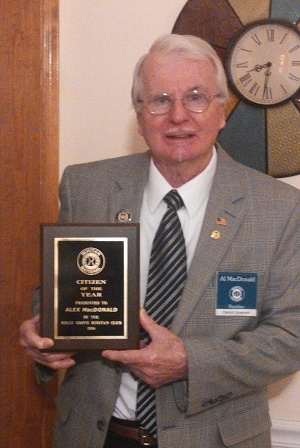 President Lesa Welton presented the Holly Grove Ruritan’s Citizen of the Year award to Holly Grove Member (and Rapidan District Governor) Al MacDonald. Congrats to the new club officers, and to Al MacDonald for a job well done!